Select the value to convert from, by opening the drop down selection or tapping to entering a value. Then select the units to convert from. Next select the unit to convert to. Now press convert Convert, or on Pro version it is real time and will show the converted value. Select the Time to convert from (this can be time in 24 hour format). You can press Now to convert the current time as on your device. Next select the base time zone, or the time zone of your country. Next select which country, city or timezone you want to convert the time to. Press Convert or in the Pro version its realtime. You may be required to wait a few seconds in between each time conversion due to limitations of third party API and to prevent overuse and abuse of the time converter API. The app will accomadate for daylight saving time. Select the value to convert from, by opening the drop down selection or tapping to entering a value. 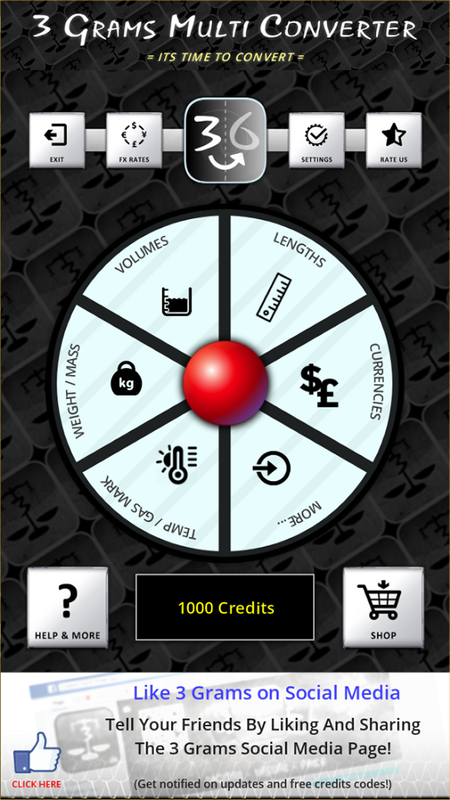 Then select the currency to convert from. Next select the currency to convert to. Now press convert Convert, or on Pro version it is real time and will show the converted value. 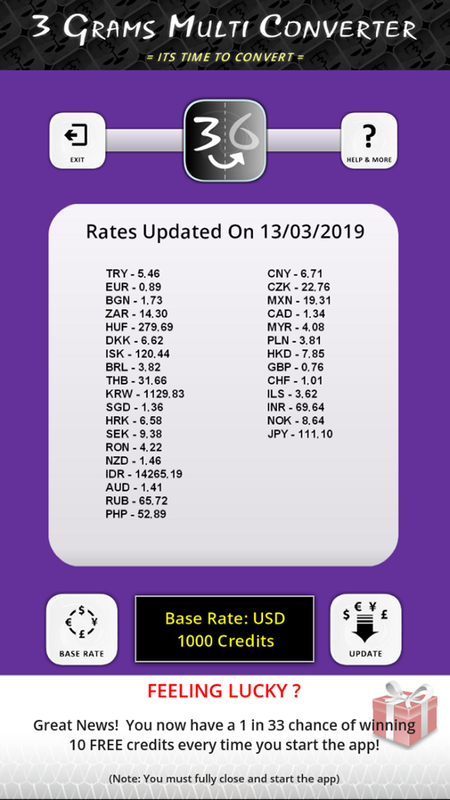 These are based on third party exchange rates. Whenever you change the base currency you will have to press update to download updated exchange rates for that currency. Select the base currency to convert from if you havent already. Now press Update button. It will now show the exchange rate based on 1 unit of the base currency. On USD, GBP and EUR it will also show the Bitcoin rate. You can only update exchange rates for the base currency once. If you for some reason need to update the rates again more than once per day, just switch the base currency to a different one and then back to the same one. 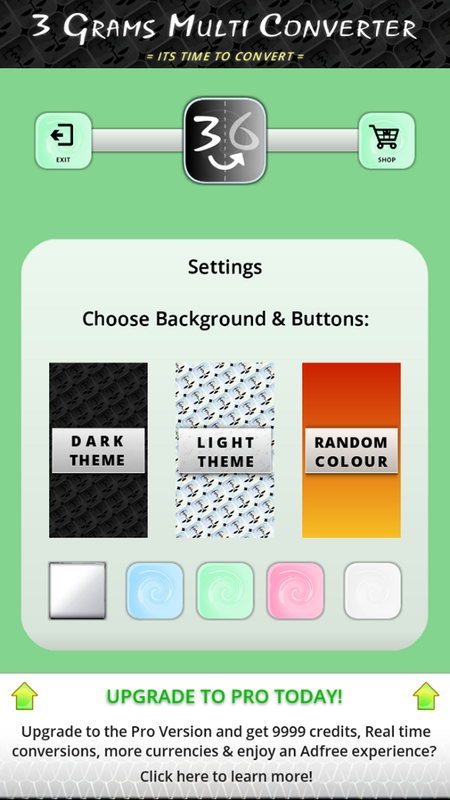 Here you can set the app background and buttons theme. The best way to learn how to use the 3 Grams Multi Conveter is to watch the video on Youtube. Why Would I Need A Converter App? There are online resource such as on Google that allow you to convert units. 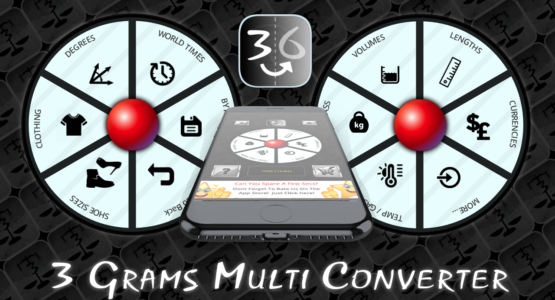 3 Grams Multi Converter however gives the advantage of wrapping up a multitude of over 10 converters in one easy to use app. The user interface is not cluttered or confusing like alot of converter apps. 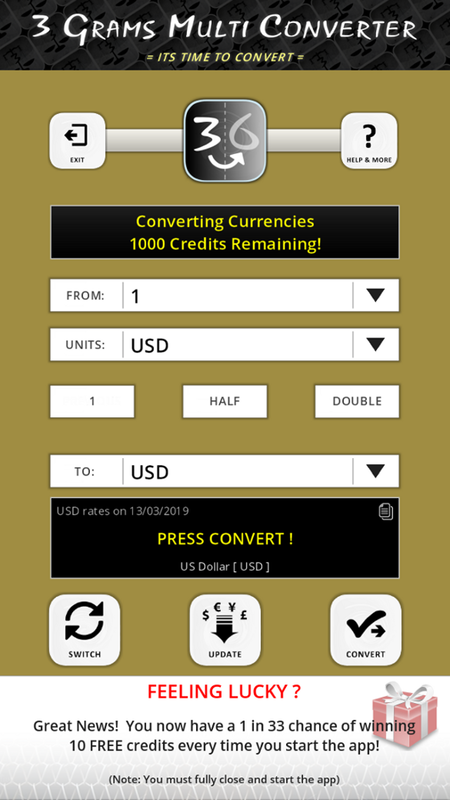 Also you can use this converter app offline, even the currency converter can be used offline once you have downloaded exchange rates for a currency.